Rams shake off icy start to pull away, then hang on against Bulldogs. Staff photo by Joe Phelan Lawrence's Adam Duprey and Cony's Matt Wozniak jump for a rebound Friday in Augusta. AUGUSTA — Ice cold in his first half of the season, Simon McCormick found the groove the Cony boys basketball team has been looking forward to seeing in the second. McCormick scored 20 of his 24 points after halftime, leading Cony to a 66-55 victory over Lawrence as the basketball season kicked off Friday night. McCormick led the Rams in scoring, while Dakota Dearborn had nine and freshmen Luke Briggs and Brayden Barbeau had nine and seven, respectively. Ian Bowers, a 6-4 senior, scored seven and grabbed 15 rebounds. 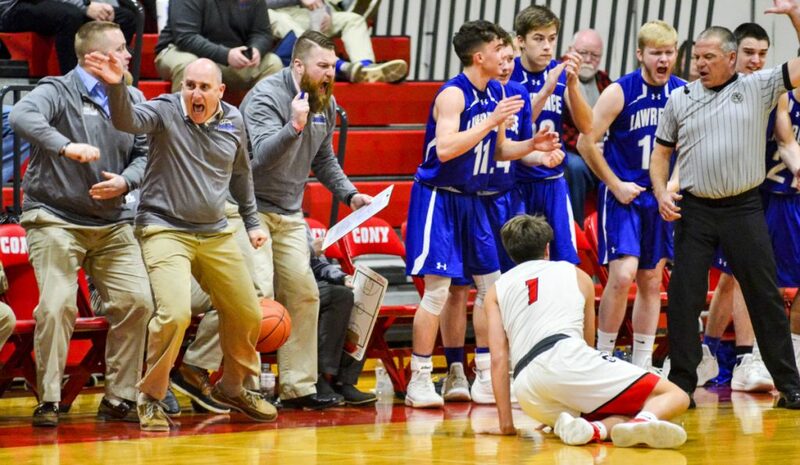 Staff photo by Joe Phelan The Lawrence bench celebrates when the Bulldogs get possession after the ball went out of bounds off Cony’s Ian Bowers on Friday in Augusta. 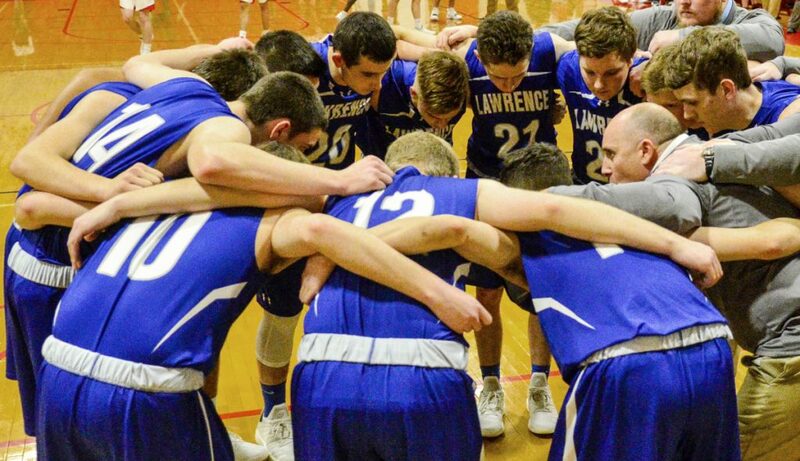 Jackson Dudley led Lawrence with 14 points, while Nick Robertson, Kobe Nadeau and Gavin Herrin scored 11 apiece. Even when the Cony lead swelled to 59-45 in the fourth, the Bulldogs didn’t quit, cutting the deficit to six points before a pair of charges with 1:42 and 1:16 to play doomed their chances. Cony struggled to an 8-for-31 start from the field in the first half, and its star guard in McCormick couldn’t find a rhythm, with Maines noticing he was hyperventilating while trying to get his game under control. In the second half, McCormick began to attack the Lawrence defense. 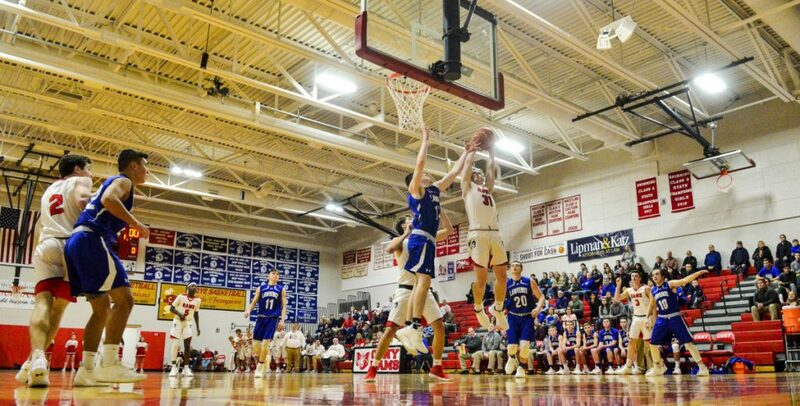 He drove for a basket to give Cony a 30-29 lead with 4:56 left in the third, then drove again, scored in transition and hit a jumper to cap an 18-8 Cony run and put the Rams ahead 41-35 with just over two minutes left. 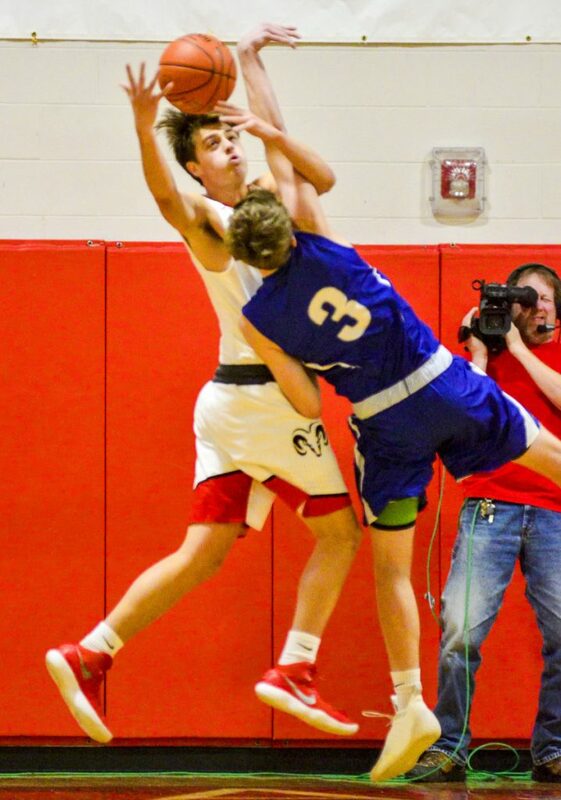 Staff photo by Joe Phelan Cony’s Ian Bowers, top, and Lawrence’s Dylan Martin-Hacey battle for a rebound Friday in Augusta. Lawrence closed to within 48-42 early in the fourth on a Dylan Martin-Hacey 3-pointer, but Cony pulled away again. Dearborn hit a three, McCormick scored on a 3-point play, Bowers had a putback and McCormick hit a 3-pointer to cap another run, this time 11-3, and put the Rams ahead 59-45 with 4:32 to play. 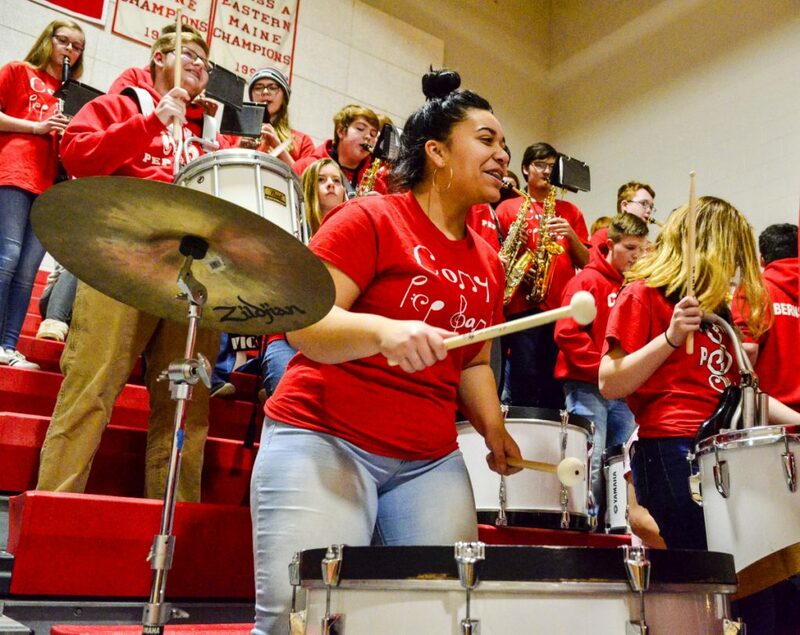 Lawrence had enough left to scare Cony, taking advantage of turnovers and going on a 10-2 run led by four points from Dudley, but the Bulldogs’ miscues at the end stymied the rally. 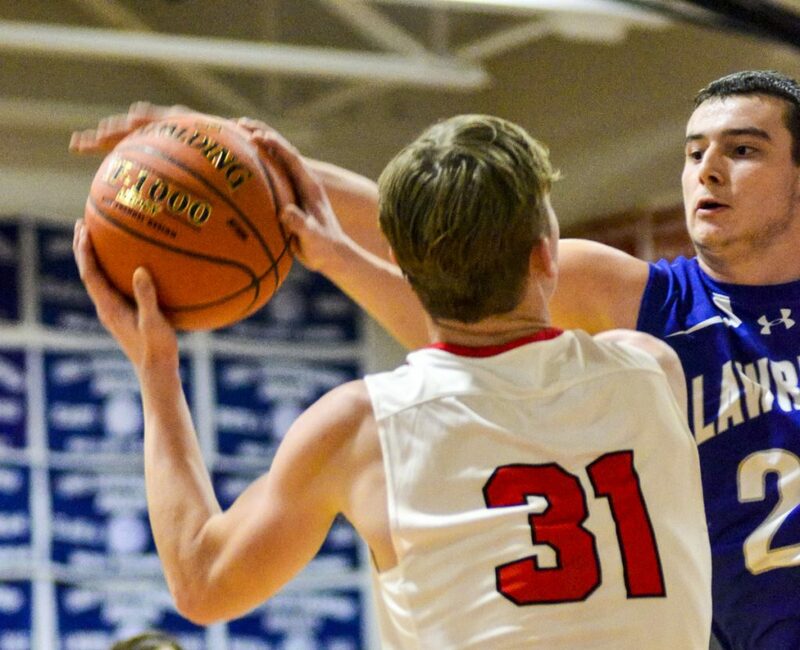 Staff photo by Joe Phelan Cony’s Matt Wozniak, left, looks for a teammate to pass to as Lawrence’s Gavin Herrin plays defense Friday in Augusta.